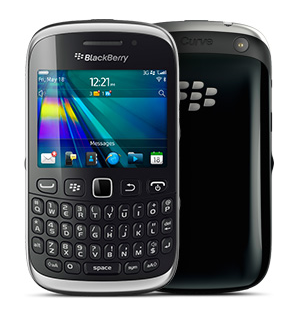 Research In Motion on Wednesday released the BlackBerry Curve 9320 smartphone proving that despite the promise of BlackBerry 10, the company hasn't lost its ability to offer handsets that are well behind the times. The latest Curve looks like every keyboard-centric Curve that came before it (just a little bit sleeker) and offers specs that don't even come close to what you can get from an iPhone, Android device, or even a $50 Windows Phone. If you're in the market for a new BlackBerry smartphone this is not the handset you want and here's why. RIM is expected to unveil the first generation of BlackBerry 10 devices around October featuring a mobile platform designed for touch first. The new OS features an adaptive software keyboard that adjusts to your typing style. BlackBerry 10 also has an interesting camera feature that captures a few frames right before and after you press the shutter button allowing you to edit your photos on the fly with better facial expressions, lighting quality and other issues. RIM says it will highlight other features of the new OS closer to the BlackBerry 10 launch. BlackBerry 7-based phones such as the 9320 are not expected to get a BlackBerry 10 upgrade, according to numerous reports. And BlackBerry 10 will have keyboard fans covered with new physical keyboard-centric phones. So why bother upgrading now when RIM's next-generation phones are coming in just a few months? The device has a 2.44-inch display with 320-by-240 qVGA resolution at 164 pixels per inch, a 3.2 megapixel camera, 3G connectivity, 802.11b/g/n Wi-Fi, Bluetooth, uSD card slot supporting up to 32GB, a dedicated BlackBerry Messenger key, and built-in FM radio. It's not clear how much the phone will cost or which carriers will offer it in the U.S., but the device will reportedly sell for about $225 in the U.K.
RIM is billing this device as a great phone for first time smartphone users so let's compare it to other entry-level smartphones you can buy such as the the recently announced Samsung Focus 2. This new $50 LTE Windows Phone features a 4-inch WVGA Super AMOLED with 480-by-800 resolution, a 5 megapixel camera with 4x digital zoom and 720p high definition video capture, 802.11 Wi-Fi, Bluetooth 2.1 + EDR, and 8GB internal storage with no expansion slot. Unless you need tons of storage on your phone, the Samsung Focus 2 is a much better deal. The Focus 2 arrives on AT&T's network on May 20. Or how about picking up a $100 iPhone 4 with a 3.5-inch display featuring 960-by-640 resolution at 326 ppi, 8 megapixel camera with 1080p video capture at 30 frames per second, front-facing camera for video chat, 8GB onboard storage with no expansion slot, 802.11b/g/n Wi-Fi, Bluetooth 4.0, and 3G connectivity. Again, a far better phone at a great price point. That said the new Curve does have some interesting features that BlackBerry fans might like such as a dedicated BBM key for fast access to RIM's popular messaging service. You can also take advantage of BBM connected apps, which first debuted in 2011, that let you chat with your BBM friends inside an application, as long as they have the same app on their phone. So you could, for example, chat with your BBM friends inside a sports app to discuss last night's game. Those are handy features, and with any luck they'll be included in the new BlackBerry 10 devices coming later this year.